Many of your favorite foods and drinks are probably fermented. For instance: Bread, Cheese, Wine, Beer, Mead, Cider, Chocolate, Coffee, Tea, Pickles, Sauerkraut, Kimchi, Salami, Miso, Tempeh, Soy Sauce, Vinegar, Yogurt, Kefir, Kombucha. This site is maintained by Sandor Ellix Katz, aka Sandorkraut. I have been fermenting since 1993. In order to share the fermentation wisdom I had learned and demystify home fermentation, I wrote a book called Wild Fermentation, published in 2003 by Chelsea Green. Since the book's publication, I have taught hundreds of fermentation workshops across North America and beyond, taking on a role I describe as a "fermentation revivalist." 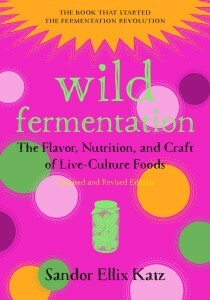 Newsweek called Wild Fermentation "the fermenting bible." Inspired by people I met talking about fermentation, I wrote a book about diverse activist projects to reclaim food, called The Revolution Will Not Be Microwaved (Chelsea Green, 2006). In 2012, with a decade more experience behind me, the unique opportunity to hear countless stories about fermentation practices, and answering thousands of troubleshooting questions, I shared an in-depth exploration of the topic, The Art of Fermentation. All three books are available for sale on this website, but the larger purpose of this website is to connect interested people with the abundant resources for learning about different fermentation practices that exist on the World Wide Web.